The objective of SERVIR Applied Sciences Team research fieldwork from 21 April to 2 May 2013 at Seti and Madi rivers in the Annapurna region of Nepal was to collect ground data to find out more about the cause of the 5 May 2012 Seti flood and past floods in the Madi River. 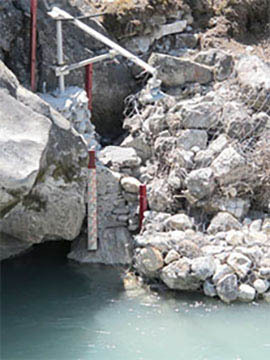 The field survey included the mapping of geology and geomorphology and sampling of flood sediments at the Seti Gorge. This research was funded by SERVIR, AST, US, and conducted by the University of Arizona in collaboration with ICIMOD and Nepali partner organizations. The team included geologists, geomorphologists, glaciologists, GIS/RS experts for hazard analysis, and a team of climbing Sherpas. 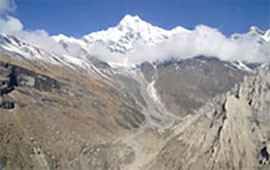 Under the Cryosphere Monitoring Project (CMP), representatives from ICIMOD and Kathmandu University carried out a field expedition from 7 to 22 May 2013 to Langtang Glacier in the Langtang Valley of Nepal. 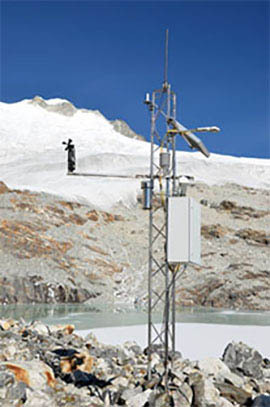 The objectives of this expedition were to install an automatic weather station on Langtang Glacier, measure discharge in Langtang Khola, and download climate data from the automatic weather station in Kyangjing. Members of the expedition collaborated with the Swiss Institute of Technology (ETH) to measure glacier dimensions and set up instruments. Team members: Joseph Shea, Glacier Hydrologist, ICIMOD; Sharad P Joshi, Glacier Analyst, ICIMOD; Lakshman Lama, Master’s student, Kathmandu University; Achut Parajuli, Master’s student, Kathmandu University; and Mohan Bahadur Chand, Master’s student, Kathmandu University.